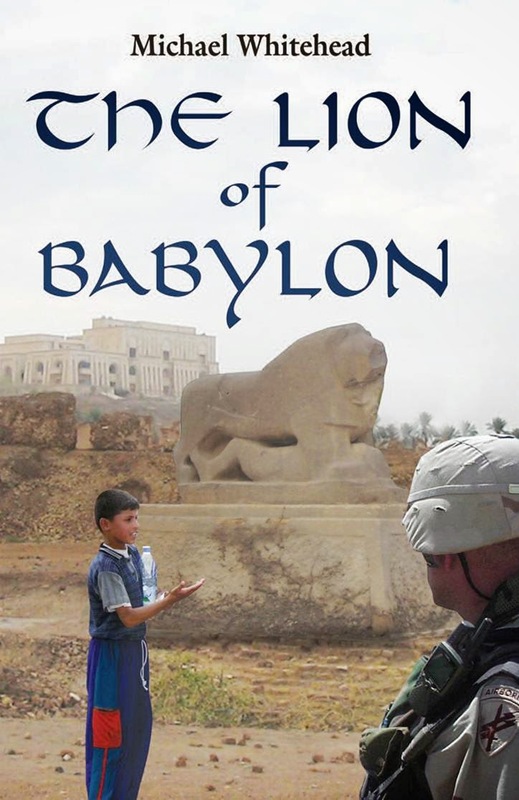 I wrote a novel about the war called The Lion of Babylon and the book has just been published. I thought that I would take the time to say how I came to write this novel. After training and preparing for a war for 26 years in the Active Army and Reserves I concluded that I would never see combat. I remember the moment that I reached this conclusion. The week of July 4th in 2001 I stood on Daytona Beach with my family and gazed at the thousands enjoying the sand, surf and sun. I was struck at how fortunate we were (me, my family, all of those people on that beach). Our nation was at peace and the Cold War, with the threat of thermonuclear destruction, had fizzled to a halt a dozen years before. The Clinton Administration had just concluded eight years of turning guns to butter. I was going to finish my time as a soldier and move on to doing something else with my weekends once a month. Two months later came 9/11 and our world changed. Since I was a member of the Armed Forces of the United States at the time my life changed a little bit more than others. All my life I've had the ambition to write and publish a novel. In 1994, at the age of 41, I decided that that I was going to do it. I took an FSU Continuing Education Class with Pam Ball (author of the novel Lava) called "Novel Writing" (or something like that). When the class ended I banded together with some of my classmates and formed a writers group. We started writing, meeting and critiquing each other's stuff. I remember Judge Terry Lewis was a member of our group and he was working on what would become his first novel Conflict of Interest. Over two years I wrote an 80,000 word novel called Every Man was Free, a dystopian tale about the survivors of a plague searching for a vaccine. Nobody would publish it. I wondered if maybe my ambition would be only half fulfilled. I would complete the writing part without getting to the published part. Eight years later, as I sat and sweltered in the Iraqi desert, I told myself that there had to be a novel somewhere in that experience. Since I had little entertainment to fill my free time I wrote long email stories to my family and friends. These emails were forwarded, as they are wont to be, and soon I had dozens of strangers contacting me and saying how much they enjoyed my stories. A lady said that I should make them into a book. So I did. An Army friend who served with me in Iraq, Craig Trebilcock, wrote a novel about Iraq called One Weekend a Month and published it using a Print on Demand publisher called Booklocker.com. He said that he had a good experience with them. In August 2006 I used them to publish my memoir on my Iraq war experience, Messages from Babylon. I returned home from Iraq in April 2004, returned to work in May and, according to my notes, started working on a novel about the war in June of 2004. I can be precise about the date because I started a Journal and the opening entries were in June. Whenever I had problems with the novel (and that was too often) I would return to this Journal, which was a Word document named "Notes." I still have it. It's 61 pages long. I started the Journal because I had an Idea but I didn't have a Story. The Idea came to me in Iraq: if we had the foresight to see the death of a fellow soldier, what would we do with the information? Could we change the outcome? What if our actions resulted in a worse outcome? This is a philosophical Fate vs Free Will discussion that doesn't need a war to lend it context. At least, it doesn't for most people, but the concept came to me often when I was in Iraq. Most of the time we lived and slept on (relatively) protected compounds. When we got in vehicles to leave the compound the relative danger increased. The level of increase in the danger depended on where we were going. Back here in the (relative) safety of the United States we get in a car and leave the relative safety of our home for the greater danger of the highway. In Iraq things were different. Before I left the compound I received a briefing on where the Bad Guys were blowing up and killing people the day before, loaded not one but two weapons and got in vehicles with other armed people. I still remember the harsh, metallic sounds of everyone around me chambering a round. And then when we left the compound we scanned our environment because we knew that there were people out there, somewhere, who wanted to kill us. This wasn't quite like getting in your car to go to work in Tallahassee. And as I left the compound I always thought, "What would this day bring?" And after executing the same process for months on end the thought finally bounced back as, "What if you knew what the day would bring?" There's a long, hard slog from an Idea to a Story to a string of sentences connected to paragraphs and pages and chapters and a completed novel. For the last nine years I have written and re-written this novel. I estimate that I wrote over 150,000 words and threw out 100,000. I joined another writer's work group and reconnected with Judge Lewis and Sam Staley, author of St. Nic., Inc., among other books. Over that time period I presented my work group with 3 different versions of the novel. They accepted the 3rd version, which means they either a) thought it was good, or b) decided that since I wasn't accepting their recommendations they would stop giving them, or c) they got tired of reading it. The Story is about a young Iraqi boy who can see the future. He sees a vision that an American soldier will come and help him fulfill his lifelong dream of finding where his parents are buried. The source of the boy's power is the Lion of Babylon. Nine years ago I set up a website for the day when my novel was finally published. The site is thelionofbabylon.com. Go check it out.